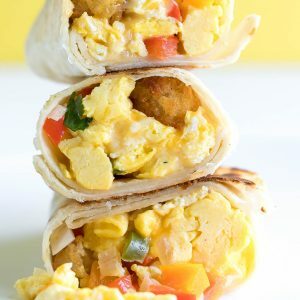 These crazy delicious breakfast burritos are ready to ROCK your morning! With easy make-ahead instructions, you'll be able to get your meal prep on and have breakfast sorted for the week. WOOT! Prep your ingredients! Crack your eggs into a large bowl, chop your peppers and onion, and grate your cheese as needed. Arrange tots on a baking sheet and set timer to bake for 20 minutes. Remove from oven once hot and crispy. The rest of your cooking can be done while you wait! Woot! Heat a large skillet to medium-high heat with a drizzle or so of oil or butter. Sauté peppers and onion until tender. Remove from pan and transfer to a large bowl. Return pan to heat and add a little more oil or butter to coat the pan. Whisk your bowl of eggs with salt and pepper, to taste. Add eggs to the greased pan and scramble until cooked through. I like to do mine over high heat in a stainless steel pan but if you're more comfortable with a different method for the eggs, go for it! Transfer eggs to the bowl with your veggies, mix 'em up, turn off your burner, and set pan aside. For easy burrito assembly I like to pop each tortilla in the microwave for 20 seconds to steam it before filling/rolling. It's much more pliable this way and they're easier to fold when warm! Warm your tortilla and arrange eggs, veggies, tots and cheese in the center of your tortilla, fold and roll until sealed. Place seam-side down and repeat for remaining tortillas. Ready to eat? Bring your pan to medium heat with a little oil to prevent sticking. Once the pan is hot, add the burritos, seam side down and cook for about 3 minutes each side or until burritos are hot in the center and golden on the outside! Serve with sour cream and salsa and dive in while they're hot! For Make-Ahead Burritos: Allow cooked burritos to cool completley. Wrap each burrito tightly in plastic wrap and refrigerate in a sealed container. To reheat, preheat oven to 350 F. Remove the plastic, wrap individually in aluminum foil, and bake until warmed through, approx. 15 minutes. If you wind up with a little bit of cheese and/or sautéed veggies leftover, save them! You can fold them into a quesadilla with some black beans for a speedy lunch! The tater tots are totally optional here! Feel free to replace them with hash browns, roasted potatoes or even sautéed sweet potato cubes. We keep ours in the fridge for the week and reheat as needed. Prefer to freeze some for later? Freeze burritos in single layer on a parchment paper lined baking sheet. When fully frozen, wrap burritos individually in foil and place wrapped in large freezer bags. May be frozen for up to 1 month.